(Nanowerk News) How does a classical temperature form in the quantum world? An experiment at the Vienna University of Technology has directly observed the emergence and the spreading of a temperature in a quantum system. Remarkably, the quantum properties are lost, even though the quantum system is completely isolated and not connected to the outside world. The experimental results are being published in this week’s issue of Nature Physics ("Local emergence of thermal correlations in an isolated quantum many-body system"). Principle of the experiment: In the beginning the atom cloud is prepared in an almost perfectly ordered quantum state (symbolized by gray atoms). 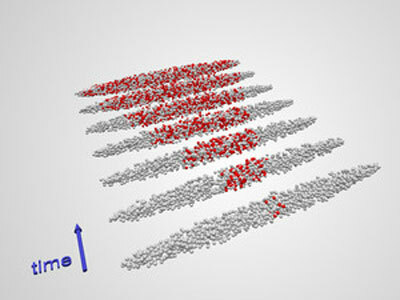 Over time, this quantum order is lost and disorder spreads through the system with a certain well-defined velocity (symbolized by the mixture of red and gray atoms). This disorder can be associated with the emergence of a temperature. The initial quantum properties are lost only through interactions between the atoms, without any influence from the outside world. The connection between the microscopic world of quantum physics and our everyday experience, which is concerned with much larger objects, still remains puzzling. When a quantum system is measured, it is inevitably disturbed and some of its quantum properties are lost. A cloud of atoms, for example, can be prepared in such away that each atom is simultaneously located at two different places, forming a perfect quantum superposition. As soon as the location of the atoms is measured, however, this superposition is destroyed. All that is left are atoms sitting at some well-defined places. They behave just as classical objects would. In this case, the transition from quantum behavior to classical behavior is initiated by the measurement – a contact with the outside world. But what happens, if a quantum system is not influenced from the outside at all? Can classical properties still emerge? “We are studying clouds consisting of several thousand atoms”, explains Tim Langen, lead author of the study from Professor Jörg Schmiedmayer’s research team at Vienna University of Technology. “Such a cloud is small enough to effectively isolate it from the rest of the world, but it is large enough to study how quantum properties are lost”. In the experiment, the atom clouds are split into two halves. After a certain time the two halves are compared to each other. In that way, the scientists can measure the amount of quantum mechanical connection between the clouds. Initially, this connection is perfect; all atoms are in a highly ordered quantum state. But as the cloud is a large object consisting of thousands of particles, this order does not remain for long. As the atoms interact with each other, disorder begins to spread with a certain velocity. Atoms in the already disordered regions lose their quantum properties. A temperature can be assigned to them – just as in a classical gas. “The velocity with which the disorder spreads depends on the number of atoms”, says Tim Langen. This defines a clear border between the regions which can be described by a classical temperature and regions where quantum properties remain unchanged. After a certain time the disorder has spread over the whole cloud. The remarkable observation is that this loss of quantum properties happens just because of quantum effects inside the atom cloud, without any influence from the outside world. “So far, such a behavior had only been conjectured, but our experiments demonstrate that nature really behaves like this”, Jörg Schmiedmayer points out. In a way, the atomic cloud behaves like its own miniature universe. It is isolated from the environment, so its behavior is solely determined by its internal properties. Starting with a completely quantum mechanical state, the cloud looks “classical” after some time, even though it evolves according to the laws of quantum physics. That is why the experiment could not just help us to understand the behavior of large atom clouds, it could also help to explain, why the world that we experience every day looks so classical, even though it is governed by quantum laws.